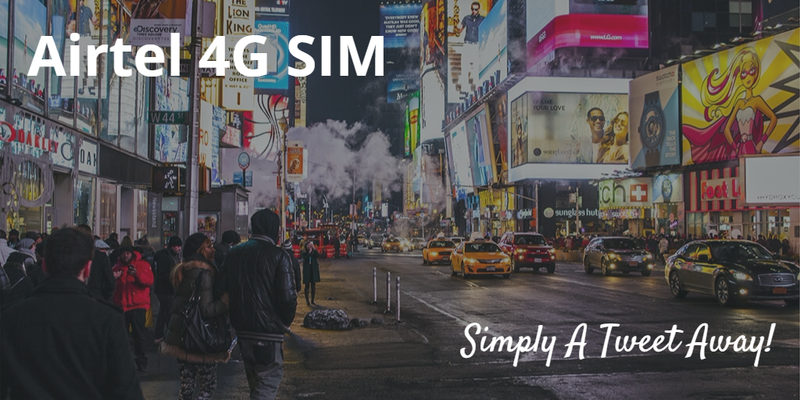 Airtel 4G SIM - Simply A Tweet Away! I chanced upon the new Airtel 4G Challenge commercial on TV while channel hopping, and it really set me thinking. Looks like great times are in store for all of us who are turning to their mobile for surfing the Internet. If you are an existing 3G subscriber, Airtel is offering a free upgrade to 4G. That's a steal! Enjoy the same mobile data benefits as your current 3G pack but at super-duper fast 4G speeds at no additional cost. If your device is not 4G compatible, do not worry. You can grab one for as low as INR 5,999 here. If the SIM that is currently active on your number isn't ready to run 4G, you can request one and have it delivered to your doorstep for free from here. Free and secure delivery at your doorstep, can you possibly ask for more! By the way, did I mention that an Airtel 4G SIM is just a tweet away? You heard it! Send a tweet with #GetAirtel4G from any 4G handset and see the magic unfold within a fraction of hours. Airtel offers this unique 4G SIM delivery service to its subscribers only. Get a brand new 4G SIM delivered to your home for free. How cool is that! On tweeting #GetAirtel4G, you'll receive a reply from the @AirtelIndia handle with a unique link. You only need to click this link and enter your details for the SIM delivery. Cannot get any easier than that! So what are you waiting for? Get, set, go. Choose a 4G plan from Airtel that best suits your needs and connect to the fastest network ever. An experience you'll not regret for sure.